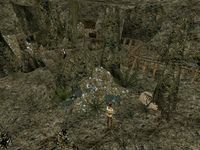 Abaelun Mine is the only working diamond mine in Vvardenfell, located just over the hills northeast of Caldera. 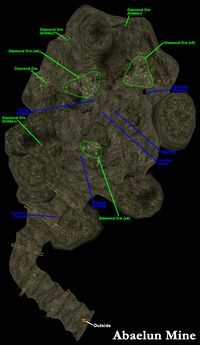 It is run as a combined effort by the Imperials and Dunmer House Hlaalu. 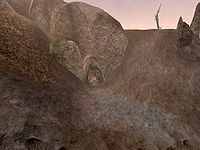 The mine is guarded by two Imperial Guards, and is worked by four Dunmer miners. Other than the rich stash of diamonds (some of which are hard to see or behind rocks), this rather small mine is unremarkable.